After a nice long hiatus, I made the journey into Orlando to meet with one of my Lyme doctors. It was a bad news/good news/bad news scenario. First the bad news. My C4A level (blood work) ought to be down around the 2000 range. Mine is now over 11,000. Up by 3,000 since my last round of blood work. It seems I am an over achiever. What this indicates is either a Lyme resurgence, inflammation, or the high presence of yeast in my system. Or all of the above. So, I’ve been given a new prescription which will help bind the toxins and get them where they need to go. I also need to up my Probiotics. Now for the silver lining in my grey little cloud. My doctor feels that after 18 months on antibiotics, my system needs a break. I AM GETTING OFF OF ANTIBIOTICS for the next 5 weeks. Then we’ll reassess. I’m still taking all the herbal medications, vitamins, supplements, and the kitchen sink. But I’m thrilled to get off of the antibiotics. That was the good news. Now for the last bit of bad news. Because of toxins, yeast, inflammation, and what-have-you, my doctor strongly suggested that I greatly reduce SUGAR AND GRAINS. Greatly. And sadly, Fiddledaddy was sitting next to me to bear witness. Not stifling a great big I TOLD YOU SO spoken not with his words, but body language. A head wiggle and an eyebrow raise were involved. And I heard a barely audible snort. I may or may not have thought about punching him in the throat. But showed amazing restraint and did not act upon it. He informed the doctor that he sends me articles to this effect ALL OF THE TIME, but that I block his e-mails. Oh, here is some good news. I can have coffee. But bad news – I cannot have my daily frozen coffee drink that I dearly love and will miss with every fiber of my being. For the next 5 weeks I will be getting creative as far as my snacking opportunities go. If you have any non-sugar non-grain snack ideas you’d like to share (that doesn’t involve styrofoam), I’d be so very appreciative. As a little testimonial to how far I’ve come medically speaking, I thought I’d tell you what I did this weekend. On Saturday afternoon, we had a big family gathering at the beach to celebrate my nephew’s recent marriage. He graduated from basic training and married his girl all in the same week, so this was the first time they’ve been home so that we could properly celebrate. We have an unusual family in that the adults act goofier than the children. For the most part. There is also a rather significant competitive edge among the aunts and uncles. There was some smack talk about athleticism, especially among the 40 and over set, so the gauntlet was thrown down in the sand and a volleyball game was born. With players ranging in age from 9 to mid-50’s. I was one of the players. And for the record, I was NOT the oldest player in the sand. This was a rather big deal for me, as I’ve not played volley ball since Reagan was in office. I managed not to look as foolish as I could have, and was able to serve, set, and even return a ball or two over the net. It occurred to me during the game that this time two years ago I could not even brush my own hair. And here I was. 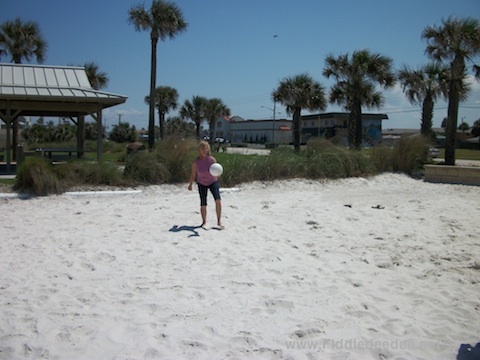 Playing volley ball. Without a Wii remote in my hand. I even broke a sweat. At one point I found myself face down in the sand (not because I was going for a shot, but because I tripped over my own feet), but I managed to pop back up without the aid of a fork lift. The other players moved WAY up when I served, as I have a low and mean serve. Still I battle Lyme Disease. But I have the upper hand. Which I’m able to raise high above my head. Never did I ever think I’d be frolicking in the sand playing a game of volley ball again. I am so very grateful for that. And extra strength Tylenol. I’ve been wallowing in a week long funk that I cannot, for the life of me, find a good excuse for. Even if I made something up. I’m even having a good hair week. But still. I’ll be willing to bet that I go through this at about this time every school year. The end is in sight, I have no idea how I’ll find the strength to do this another year, and there’s no way we’ll be finished by the end of May. And yet, we do finish, I attend the Homeschool Convention in May with my com padres, and am renewed enough to think that I can stay just one day smarter than my children. For one more year. Thankfully, nearly every homeschooling mom that I commiserate with is feeling the same thing. I find comfort in that. Because I’m shallow. In other news, my doctor gave me the go-ahead to begin my juice fast, and even signed off on the fact that I will stop taking my antibiotics and supplements for the 7 days, and resume only when I’m eating whole foods again. I really think I’m most looking forward to NOT taking my fare of 70 some-odd pills a day. The juicing will be a cake walk. Ooohhh. Cake. I’ll still take those pills that control my testosterone (WOOHOO) and keep my hormones in check, you know, for the well being of the people that I live with. I mean, me without caffeine and food, and HORMONAL = a spot on the 10:00 news. And not in a feel-good-kind-of-story way. 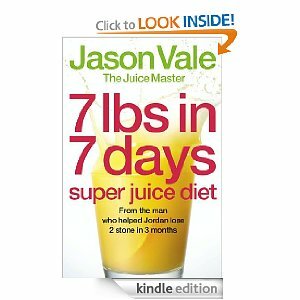 I’ve finished Jason’s Vale’s book “The Juice Master Diet” and now I understand why he says that it’s imperative to finish the book before beginning. The success of this whole adventure will depend on PREPARATION. I began collecting all the supplies I will need, such as Wheatgrass powder, Spirulina powder, Fiber, and organic Alfalfa Sprouts. Doesn’t all of that just make your mouth water??? Tomorrow I will go forth and hunt and gather all of the fruit and vegetation that I will need. My plan is to start on Saturday. I kept finding excuses to put this off, mostly having to do with social scheduling, but as the book repeated ad nauseum, NO EXCUSES. There will never be a 7 day stretch when we have nothing going on. I’ll be likely posting over the weekend, charting my progress. I have a number of real life and cyber friends who are on this journey with me. I’m in good company. Fiddledaddy wants to support me by doing this with me, but I want to talk him into waiting a week or so, because I believe that one of us should be able to care for the children. Should I be rendered useless. I look forward to challenging myself through this process, and feel that nothing but good will come of it. My greatest hope is that I will finally have energy, and feel so wonderful, that I’ll never want to go back to eating unhealthily again. Have a great weekend, everyone. And I’ll be checking in soon. Thank you for all of your encouragement about my upcoming juice fast. Which, as I’ve learned, isn’t really a fast at all, since I will be taking in plenty of nutrients through fruits and vegetables by either juicing them or making smoothies via my Vita-Mix. And no, I won’t be tossing in any Oreos, hoping no one will notice. Although it did cross my feeble mind. I’ve recently learned is that a true fast is where you only drink water. I don’t think I would do well on a fast. What I’m about to attempt is a 7 day detox. I’m reading through Jason Vale’s The Juice Master Diet. He’s the first to tell you that he hates using the word “diet” in any title because it can be misleading. Weight loss usually occurs as a happy byproduct. But the reason for doing this is to detoxify, getting all of the garbage out of the way, allowing your own body to heal itself. As our bodies were made to wonderfully do. He clearly warns that you must read the book cover to cover before starting so that you understand all the hows and whys of the program. This will help to ensure success. I’m nearly half way through the book, and have been substituting one juice or smoothie for a meal each day. I’m not completely off of caffeine yet, but I’m cutting back. And no one has had to die needlessly. I thought I should mention that. After the initial 7 days, I’ll reassess to see if I need to continue taking in only fruit/vegetable juices. I don’t know of any other chronic Lyme Disease patient that has tried something like this to kick start their immune system. But I’m still looking. Another thing that I will likely do is hit the pause button on all of my antibiotics and herbal medications for the 7 days. Many of these must be taken with food. I’ve tried taking my pills along with a substituted juice meal, but end up with pretty significant nausea. And of course I’m not going to do this without my doctor’s supervision. So there’s the update. I’ve had a few friends step up to the dinner plate and they’ve told me they’ll do the program with me. WOOHOO. I hope to start this next weekend. We have friends coming into town, so I’ll likely wait until they leave. Just in case I’m, you know, crazy cranky. Not that you can really tell the difference. Thanks again for all of your sweet encouraging comments and e-mails! I’ll be charting my misery progress when I begin, and of course I’ll share all of my favorite juice recipes. I’ve had a rough couple of days, while dealing with some issues related to my Lyme Disease. Issues that I’m praying are strictly related to what is called Lyme die-off, and not a resurgence of the disease. Since my two tests (CD57 and the Ca4) came back no where even in the ballpark of someone who is out of the woods, my protocol changed, and so my hope is that I’m experiencing a Herx Effect. Some of those symptoms include joint pain, pain when walking, tired, and pretty much feeling like someone is sitting on me. Which sometimes they are. Like today when two of my children realized I wasn’t feeling well, and they came and sat on me. A touching moment. Painful. But touching. Since all of this kind of comes and goes, I really feel like it’s the Lyme Disease fighting back, but I still have the upper hand. All this to say I’ve been cutting myself a good deal of slack by sitting on the couch. Catching up with my friend the TV, watching some of my favorite shows. I have allowed myself to follow the American Idol experience more closely this year. Especially since I have grown very fond of the judging trio. This is a nurturing group that genuinely seems to want these kids to succeed. In years past, I’ve avoided the early shows because of all the mean spiritedness. From the guy in the white t-shirt. Who I must admit, I miss from time to time. Not enough to watch his new show. But still. Tonight I watched the judges whittle the contestants down to the top 24. Since this is only the first night of the whittling, only 13 have been selected thus far. And I am absolutely tickled for the early front runners. There is one guy that Fiddledaddy and I are particularly rooting for. That would be the Asian singer, Heejun Han. He has been the nervous Nellie who shakes his arms when on edge, but delivers amazing vocals. I’ve fallen in love not only with his voice, but with his personality. AND he works with disabled kids. He could honestly go into standup if the whole singing thing doesn’t work out. His banter with the Cowboy during group week was priceless. And let me just say that I hope the screen door didn’t hit Cowboy on the backside of his Wranglers on the way out. That’s the snarkiest thing I’m going to say all season. Pinky swear. I can’t wait to see how Heejun grows in the next weeks or months. Also, another frontrunner that I see going an awfully long way is little Jessica Sanchez. She’s only 16 and has such a mature presence onstage. Her last solo blew me away. She’s Disney princess material. That’s the only early predictions I’m up for so far. In years past I have been reluctant to declare an early winner because when judging any type of singing, I AM CLEARLY OUT OF MY ELEMENT. So, are you watching this season? Who stands out for you this early in the game? I thought it time for a little progress report. I had blood work done in the last few weeks that would determine where I was as far as my battle with Lyme Disease. I had to go to two different labs, and in days gone by, and what with my uncooperative veins and all, I would simply tell the nurse to punch me in the face to procure a sample, as that would be easier. However, at the first clinic, two sticks was all it took. At the second clinic a couple of days later, only one stick. One of the happy by-products of Lyme Disease is that for whatever reason, your veins will likely collapse. In my mind, they simply faint. So when it was easier to get blood from me, I was all I’M CURED! And seriously, I feel really really good, and was totally expecting my doctor to give me a clean bill of health on Monday and tell me to go ahead and chuck the rest of the antibiotics that I’ve been on for 13 months. My antibiotic protocol has evolved over the last year or so, so I’ve been on varying antibiotics at different times. Right now I’m only on two, and one is for only 3 days a week. Plus of course all of the other herbs and supplements. Oh. And the blessed hormones. Because I’m obviously going through the change. Hold me. And if you’ll notice, lately there have been no tales of menses or PMS that would kill any mortal man. And while I’m thinking about it, I recently learned that my pastor reads my blog. Which delighted my husband. BECAUSE I’M SO RARELY INAPPROPRIATE. AND POSSESS THAT ALL IMPORTANT FILTER IN MY HEAD THAT SENDS A RED ALERT: DON’T PUBLISH. And then I hit publish anyway. Where was I? Oh, my progress. Focus. I sat across the desk from my doctor as he went over the results of my blood work with me. The CD57 test was a 21. It should be around 120. What that means is that my immune system is still compromised, which is indicative that the Lyme Disease is still very present. If I were to go off of my protocol, it would likely return with all of the old symptoms. This was a little surprising to me, since right now I feel completely symptom free. Which is the blessing in this whole ordeal. I’m a fully functioning chronic Lyme Disease Patient. Who has only been treated for a little over a year. I’m considered a great success story. It is not unusual for patients with the levels of Lyme that I have to be treated for years. And still have severe symptoms. So I did not allow this news to trigger any type of pity party. We’re still waiting on one more test result which will aid my doctor in knowing if we should change up my antibiotic regiment. In the meanwhile, I forge ahead. And I’d like to shout from the rooftops that I’m back at the gym. At 5 freaking thirty in the dark of the morning. My SIL is a fabulous trainer, and I meet with her and my other two SIL’s plus a friend for torture a workout 3 times a week. At one point I reached over to pick up a laundry basket this week. What is that pain? Oh. I HAVE ABS. A wonderful revelation. I’m still battling Lyme Disease, but it is not fighting back. We’ll just call that a victory. I just wanted to pop in quickly to say a huge THANK YOU to BlogHer and Pfizer for the Return to You campaign. Thank you for giving me a platform to talk about Lyme Disease openly. I’ve been away from the internet for much of the last week, and was greatly surprised by the traffic I’ve gotten on this post, and the subsequent traffic I’ve received on my Lyme page. I count it a privilege to be able to put a voice and a face to this disease, and am so grateful for the ongoing dialogue with other Lyme and possible Lyme patients that I’ve had over the last few days. On Monday we packed up the van to head into Orlando for a much anticipated check up with my Lyme specialist doctor. To humor him, I quickly typed out some questions on my iPad. And may or may not have included some ideas for grocery shopping later in the week. Because I have the attention span of a gnat. The meeting went well. We slowed down my antibiotic usage just a bit a few months ago, and I seem to be holding my own. My real concern was that I’ve got some hip issues which have been plaguing me over the last month or so. I’ve not been sure if it’s a new flare-up or Lyme die-off. The doctor thinks that my hip and back issues are a result of spending a year on crutches/in a wheelchair/face down on the linoleum. I prefer to think it’s an old disco injury. He’s written me out a prescription for some good old fashion hip and pelvic x-rays just to see what’s going on, and I have a fabulous chiropractor. The only chiropractor on the planet that I trust enough to let him CRACK and POP stuff. He came in awfully handy today when I suffered from a muscle spasm in my back. Which, WHAT LUCK, showed up on a day when I was also experiencing cramps that would kill any mortal man and HOT FLASHES strong enough to melt my bra straps. In other words, I was a joy to live with today. I will be having some more blood work done in January to see where my Lyme levels are, but my focus is quite simply to get through Christmas. And frankly, that’s what we should ALL hope for. Over all, the Lyme doctor is very pleased with my progress over this last year, and I’m frankly ecstatic. It was exactly a year ago that I began my antibiotic/herbal protocol and I feel pretty darn close to normal. The cramps and hot flashes simply serve to keep things interesting. The doctor answered all of my questions, plus the ones that Fiddledaddy made me ask, such as “is occasional Splenda use okay?” The answer was no. Fiddledaddy smirked. A less hormonal wife would not have punched him in the throat. I’m just sayin’.